Having done a number of shows on Marathi stage, Prashant has also worked in the film media. He has worked in numerous television serials and more than a hundred marathi films. He has worked with the big wigs of the industry and worked in some of the all time famous movies like - PASANT AAHE MULAGI, SAVAT MAAJHI LADKI,EKDA PAHAVA KARUN, ATMA VISHWAS, INA MEENA DEEKA, MADHUCHANDRACHI RATRA , WAAJVA RE WAAJVA, TU TITHE ME, BAHURUPI, MUMBAI PUNE MUMBAI 2 and the most recent BHO BHO. He has acted in a plentiful of marathi and hindi television serials and has portrayed memorable characters. Some of his works in television discipline are GHARKUL, BE DUNE TEEN, BHIKAJIRAO KARODPATI, GUBBARE, SAARE SAARE GAAUYA , KAY PAHILAS MAZYAT, DARLING DARLING and the very popular, FILMI CHAKKAR, UCHAPATI, just to name a few of his most unforgettable performances. He has also acted in Chandrakant Chiplunkar Seedi Bambawala… will also mark the Hindi small screen debut of Kavita Lad who shares a great chemistry with Prashant Damle. The hit pair has done several Marathi plays and films together. 3 and half decade ago he hadn't even dreamt of achieving what he has. After the first few stage performances during his school years and college years he got an opportunity to act in the marathi play named "Tur Tur". That proved to be a major breakthrough for him and thus he ventured into the commercial marathi theater. In it he proved his excellence in comedy. Then followed the play "Moruchi Mauvshi". Thus he started of onto an unknown journey of the theater world with these two plays "Tur Tur and Moruchi Mauvshi". During that period of struggle Mr. Sudhir Bhat of Suyog Productions, casted him into a lead role in his comedy drama "Bramhachari". That was what gave birth to his devotion and dedication to the world of marathi theater & entertainment. A special show of "Gela Madhav Kunikade" for RETIRED military jawans. 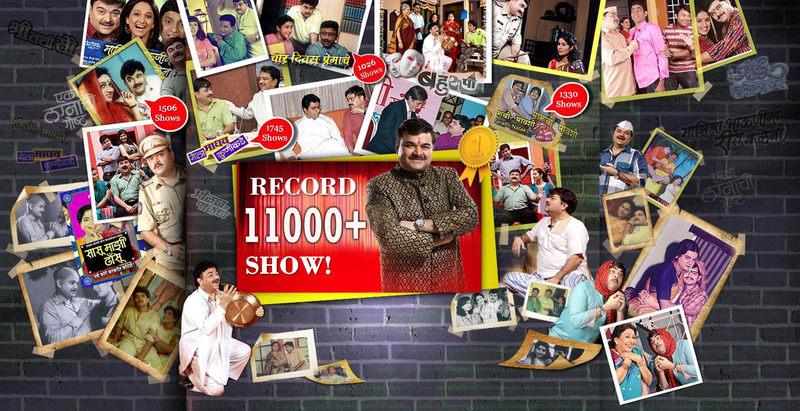 It was a very great moment when Prashant damle completed 22 runs of the Gela Madhav Kunikade theatre show and raised INR 33lakh for the Army Jawan Funds. It was first of its kind that through Art Theatre that we could contribute to the welfare of our Army Jawans. He got his first break into films "Pudhcha Paul" by Producer Mr Vinay Nevalkar and film was directed by Mr Raj Dutt thus marked his first entry into the world of Marathi films, where his performance and name was reached to a larger audience, thus further stablising his presence in the acting arena. Prashant Damle has always considered this win to be a peak point in his personal growth. As he says - "Singing has always been my passion but I became a actor. So when this show came up, I immediately took this opportunity. The journey in that show has been fantastic and a learning one. I have enjoyed every moment of the show. It was also overwhelming to see the love and blessings the audience showered on me"